Thousands of people are slavering for the chance to play a buggy, half-finished version of a popular upcoming MMO. Are you one of them? I can't be the only one who finds it funny how eager some people (including yours truly) are to get into closed tests for upcoming online games. By their very definition, betas are unfinished and rough versions of games - there will be bugs, there will be clunky gameplay, and there will be missing content. Why are we always so excited about getting a chance to play a worse version of whatever game it is we're looking forward to? 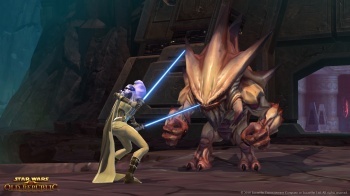 That said, I'm totally psyched about the potential of Star Wars: The Old Republic. And BioWare Austin is now taking applications for more would-be testers, signaling that a full-on beta for the highly-anticipated sci-fi MMO may well be imminent. (Edit: We have been informed that this is not a full-on beta, and is merely another internal round of focus testing). The requirements for the test seem fairly lax: You must have an active SW:TOR community account (if you've been banned from their forums, you don't get to play), and you must be more than 18 years of age. BioWare will also be choosing testers based on system specification, age and region - probably to get as wide a mix as possible - so if your computer isn't quite up to par, don't despair yet. If you want to try your luck and get in to the SW:TOR testing, here's your chance. Sign up for a community account and cross your fingers.